In an interview with CNN, Haacke said, "This is something that is very grave for all of us if free speech in this city is no longer guaranteed, and the mayor threatens artists and cultural institutions." Giuliani says Haacke's work is "an entirely inappropriate way to describe the Holocaust"
NEW YORK (CNN) -- New York Mayor Rudy Giuliani is upset by the world of art again, this time over a display that makes a political statement. "Sanitation" by German-born artist Hans Haacke (HAHK-uh) was seen for the first time Tuesday as part of a press preview for the Whitney Museum's Biennial 2000 show. The installation is described as a sharp rebuke of would-be censors of art and free speech. Last year, Giuliani's wrath was provoked by a controversial show, "Sensation," at the Brooklyn Museum. That show, which made a religious statement, featured a painting of the Virgin Mary made in part with elephant dung. The mayor's remarks and his attempt to cut off funding for the Brooklyn Museum -- an effort that failed in court -- inspired Haacke. The artist is using some of Giuliani's quotes in "Sanitation." "We will do everything we can to remove funding for the Brooklyn Museum until the director comes to his senses," Giuliani said during last year's controversy. In a square, gray room, six anti-art quotes from political figures are posted on a wall, three on each side of mounted American flags. Three quotes are from Giuliani, with one each from former presidential candidate Pat Buchanan, Christian Coalition founder Pat Robertson and North Carolina Sen. Jesse Helms. The quotes are in the Gothic-style typeface once favored by Hitler's Third Reich. On the floor is a framed excerpt of the First Amendment of the U.S. Constitution. And standing upright are a dozen garbage cans with speakers emitting military marching sounds. There are no pictures of Hitler, none of Giuliani and no Nazi symbols or images of the Holocaust. So why is the mayor upset? "It's an entirely inappropriate way to describe the Holocaust and to try to compare situations to Nazism that have no basis in comparison to it," Giuliani said. "I think it dishonors the memory of the people who lost their lives during the Holocaust." However, the mayor said he is not personally offended by Haacke's work -- which he has not seen. And because the Whitney is run by private funds, the city government has little leverage regarding it. However, at least one Whitney heir agrees with Giuliani. Marylou Whitney, a daughter-in-law of museum founder Gertrude Vanderbilt Whitney, has redirected a planned $1 million donation to a different museum in Cody, Wyoming. But two other Whitney heirs who are active museum trustees -- Flora Miller Biddle, the founding Whitney's granddaughter, and Fiona Donovan, her great-granddaughter -- back the exhibit and Haacke's work. 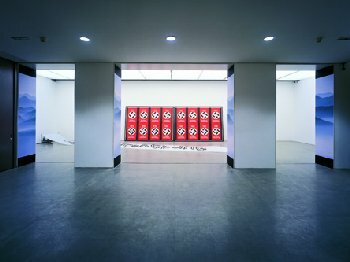 Art critic Robin Cembalest said of Haacke's work: "I see it as being more political rhetoric than a simplistic parallel between Giuliani and Hitler." Haacke said he wants museum visitors "to think about the First Amendment and the threats to the First Amendment we are seeing." Haacke is one of 97 artists chosen to display work in the biennial Whitney exhibit, which is intended to showcase emerging and established contemporary artists. The exhibition opens to the public Thursday and runs through June 4. "This will be a show that challenges you. This is part of what art is meant to do," Whitney director Maxwell Anderson told CNN. Whether it invokes images of the Holocaust or raises issues of free speech, the controversy surrounding the work is bound to boost ticket sales. "Helmsboro Country" by Hans Haacke is part of the new show at the CAC. 142 photographs of New York apartment buildings, 2 maps of New York's Lower East Side and Harlem with properties marked, 6 charts outlining business relations within the real estate group. Edition of 2. Collection Musee National d'Art Moderne, Centre Georges Pompidou, Paris. This is the infamous work that was supposed to be part of Haacke's solo exhibition at the Guggenheim Museum in New York that was abruptly cancelled six weeks before it was due to open. The curator, Edward Fry was fired and a series of protests organized by the art community was staged at the museum. It was speculated that Shapolsky's friends on the Guggenheim's board of trustees were responsible for the cancellation although the allegation was never proved. The piece describes the shady dealings of his real estate firm between 1951 and 1971. Haacke also executed a new poster project for this Documenta using quotes from corporate sponsors such as "We are not patrons. We want something for the money we spend. And we are getting it." "Whoever pays, controls." 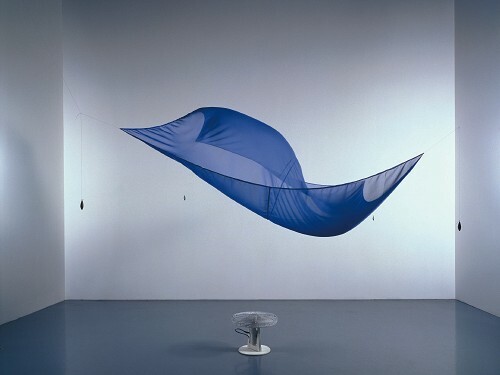 Hans Haacke's "Blue Sail" (1964-65) comes from a moment now remembered as the cusp of post-minimalism, when various artists first concerned themselves with rooting a work's form in the process of its making or the moment of its perception. The piece consists of a swath of bright blue fabric, held aloft by four weighted cords and kept in constant fluid motion by currents from an oscillating electric fan on the floor beneath it. 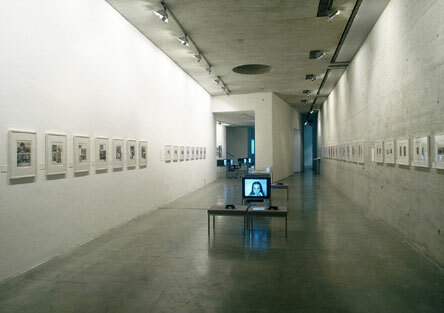 Visitors to the Los Angeles Museum of Contemporary Art's 2004 exhibition "A Minimal Future? 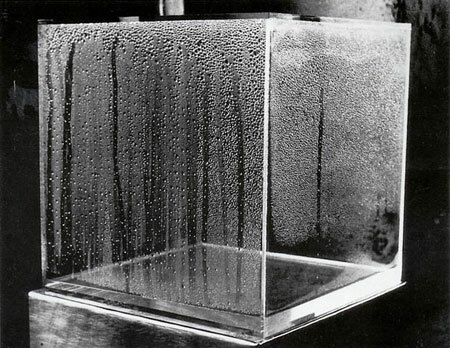 Art as Object, 1958-1968" saw "Blue Sail" in a context that underlined Haacke's shift of emphasis from art object to concept. Since the '60s, he has persisted in that direction to the point where people now think of him as a politically motivated conceptual artist who uses objects only as props. When it was new, the electric fan in Haacke's piece must have looked merely like a tool necessary to effect an idea. At this distance in time, we may connect it more readily to similar fans that appear works by Pop artists such as Claes Oldenburg, Tom Wesselmann and Ed Kienholz, who then seemed to stand across a philosophical divide from people such as Haacke and Robert Morris. "Blue Sail" adds a key work of time-centered sculpture to SFMOMA's collection of '60s art, one that also anchors the critique of color-field abstraction implicit in some of the museum's other defining works of the period. An exhibition analysing the political aspects and the element of activism in the artistic practices that have emerged from the second half of the fifties up to the present day. The repertoire of this show questions the aesthetic artefact and posits in its place a utilization of art as an instrument of social observation and critical practice. 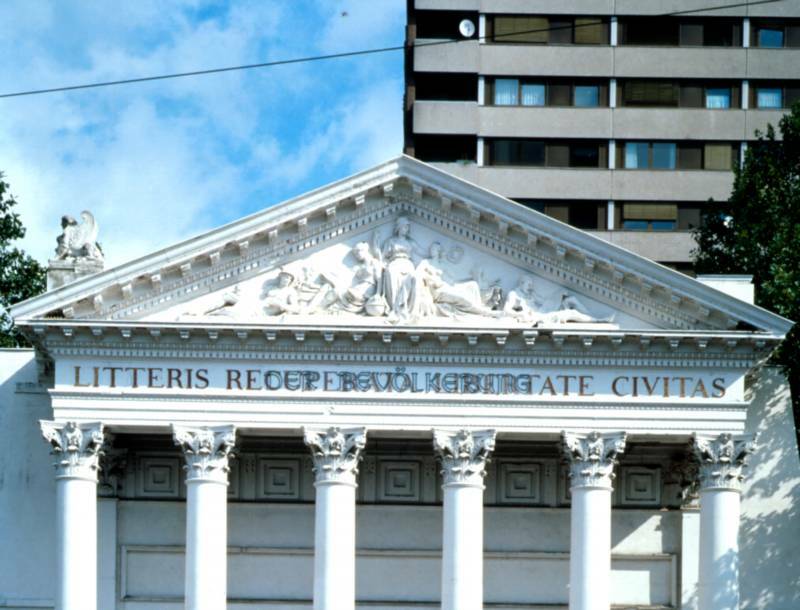 The project deploys works and documents with the aim of stimulating debate on the role of the street as a theatre for spontaneous activities, art as service, fiction and the construction of the historical memory, the post-functional object, activism and collaborative working, the questioning of the concept of authorship, alternative models of exhibition and the function of artistic practice in an ideological context. that the events of September 11th have created a filter through which we experience and measure our everyday realities. To extend the gesture to the surface of our computer desktops the project is available online as a downloadable desktop application. In the desktop version, screen-savers, browsers, files, and applications become the shadows of the World Trade Center towers. a public art project due to its widespread public visibility and historic implementation by artists. both in nature and in society - how they affect our visual culture, and thereby our sense of the world. "For the past fifteen years, Hans Haacke's work has been concerned with issues that are at the core of postmodern investigations - the nature of art as institution, the authorship of the artist, the social behavior of the art world, the network of cultural policies such as the role and function of the museum, the critic, and the public, and many other sociological problems." Haacke challenges audiences perceptions as he continually critiques the museum. His installations may seem confusing to viewers who stumble upon them, as he simply uses objects in the museum collection to create an installation. The choice and arrangement of objects in the installation is important as they contain subtle messages. Visitors’ Profile consists of a questionnaire about contemporary events that was distributed to museum visitors to a group exhibition in Milwaukee. 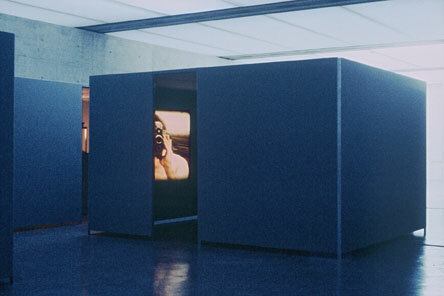 While Haacke had used questionnaires in his works before, this particular questionaire was the first time that he successfully used a computer to compile the results and generate a statistical profile of the exhibition’s audience. This important historical work introduces the idea of visitorsplaying an active role in their information environment and “completing” the work of art. Would the fact that Governor Rockefeller has not denounced President Nixon's Indochina Policy be a reason for you not voting for him in November? "Ballots" were dropped into either of two plexi-glass ballot boxes (visitors chose "yes" twice as often as "no"). For Bowery Seeds, Haacke carved out a small circular area of earth, enabling airborne seeds to take root. Th artistic activities of Hans Haacke (b. 1936, living in New York) can be situated in the context of concept art. In his works, Hans Haacke is concerned with complex social contexts. Since the '60s, the artist is dedicated, among others things, to creating awareness of the relationships between art, capital, and power. 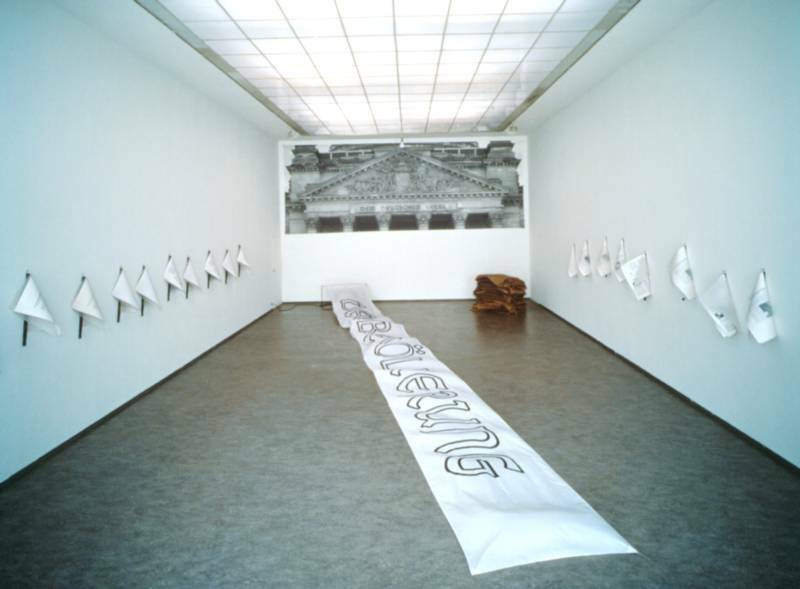 In the exhibition at Portikus, Hans Haacke makes reference to his controversial project for the Berlin Reichstag building; the Bundestag (Lower House of Parliament) consented to its realisation on April 5, 2000. The first phase of the project has meanwhile been completed. In a low box measuring 21 x 7 metres installed on the floor of one of the two light-wells, Haacke's dedication DER BEVÖLKERUNG (TO THE POPULATION) was set in white neon-sign letters to complement the inscription DEM DEUTSCHEN VOLKE (TO THE GERMAN PEOPLE) located above the entrance portal. The members of the Bundestag have been invited to strew soil from their respective constituencies around the letters. On September 12, the President of the Bundestag, Wolfgang Thierse, will initiate this second phase of the project. Spontaneous growth will be left to itself. 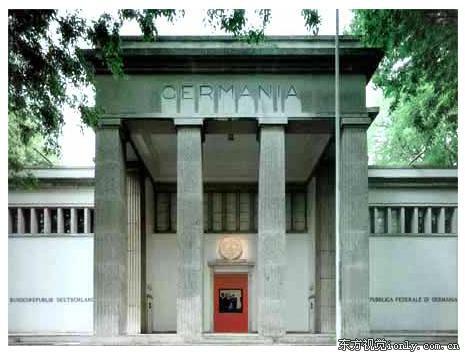 The exhibition additionally alludes to the architectural parallels and the significant differences between the pictorial programmes and the inscriptions of the Frankfurt portico and the portico of the Reichstag building. Hans Haacke has thus developed a version of his Berlin project conceived especially for this specific context. Located on the Munster promenade there is a war memorial Ehrenman am Mauritztori. The sculptor Bernhard Frydag chiseled on his monument the following dedication.," 1864 1870-71 1866 IN MEMORY OF WARS AND VICTORIES AND THE REESTABLISHMENT OF THE REICH". These dates refer to the wars Bismarck waged against neighbors of Prussia. This war is known in the German history books as the German-Danish War which led to the annexation of Schleswig-Holstein by Prussia and ( for two years) Austria. and the German French war. In 1871, in Versailles, the Prussian King Wilheim I was proclaimed emperor of the newly established Reich. Since 1815, Munster has been part of the Prussian province Westphalia. The monument Ehrenmal am Mauritztor is popularly called,"Masentempel" (monument of asses). Haacke has erected right next to this monument , exactly in the diameter and height (6 to 7 meters) cylindrical shack made from rough blanks. Barb wire is placed around the top t prevent the wall from being scaled. A children's carousel with lights and music (Deutschland Uber Alles - the German National Anthem) plays on and on...directly enclosed behind the planks. Only where there are small gaps in the planks can you glimpse the carousel. the inverted juxtaposition between the monument and the enclosed cylindrical wall creates a profound and moving statement. NEW YORK — "None of the battles (between artists and private museums) have been won, but if there is not an alert public these [freedoms] will wither," said conceptual German artist Hans Haacke last night at the First Amendment Center. The discussion of artistic free expression was part of the "Whitney Dialogues" program series co-sponsored by the Whitney Museum and the First Amendment Center. It was taped for "Speaking Freely," a First Amendment Center television show on MetroArts channel 13. Haacke's exhibit at the Whitney Biennial caused a commotion in the New York art world last year. Some characterized his work as downplaying and trivializing the. Co-moderator Ken Paulson, First Amendment executive director, noted Haacke's exhibit "roused the mayor's objections" and prompted a news-media stir even before the work was shown. "It was quite startling and frightening," said Haacke. "The New York Times had a story about my work on page one." He called accusations by the mayor and the media a "feeding frenzy." The Whitney Museum, which had commissioned the piece, allowed the exhibit to go forward as planned. "At the Whitney we frequently hire artists and their work sight unseen," said the museum's executive director, Maxwell Anderson. "I couldn't not support an artist we'd commissioned, and we had every intention of honoring the Whitney's promise to [its] artists." But not all museums have felt the same way about Haacke's work. In the 1970s the Guggenheim museum in New York pulled a Haacke creation that purported to expose misdeeds by a prominent local businessman. "The Guggenheim had invited me for a solo exhibition, but they saw my work and it was canceled," said Haacke. With corporations frequently backing private museums, an artist's freedom of expression can be a concern to free-speech advocates, panelists said. But this concern is becoming more political than corporate, they said — a major example being New York Mayor Rudolph Giuliani's outbursts over artwork at the Brooklyn Museum of Art. "Today's corporate culture has become self-mocking to be acceptable to a younger audience," said Maxwell. Haacke agreed: "Corporations don't tell museums what artwork to do." However, both agreed that curators need to appease those who fund them. "Are museums afraid of you?" Paulson asked Haacke. "Over the years, I think yes," he answered. "After the Guggenheim show was canceled, a lot of museums, for understandable reasons, let [me] pass." Haacke's outspoken beliefs may have cost him art exhibits but his work has survived. His show "Persuasion" ran at the Lombard-Freid Fine Arts gallery in Soho, New York. Another called "Temporarily Possessed" belongs in the semi-permanent collection at the New York Museum of Contemporary Art.